The air is crisp here in Boston. Part of me isn't ready for the seasonal changes, although I have to remind myself that it is, indeed, almost the end of September - fast but true, and with the marching days comes chillier days when walking around in just a t-shirt isn't quite enough. We're about to start the second full of week of school. So far we've already had one studio review, a handful of assignment deadlines, a site visit (also studio related), the first large group where the Grad Christian Fellowship's worship band performed, and the first Bible study for architecture and planning students. Whew! 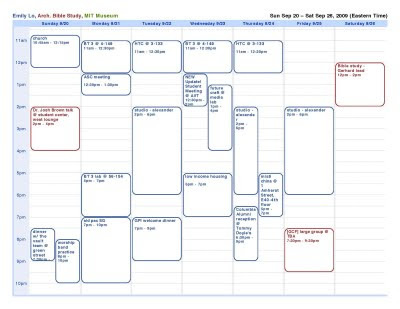 Those bubbles represent 4 classes (finally have settled with Future Craft as my elective, although part of me still wants to check out a low-income housing seminar... sometimes I just need to say NO MORE) with some additional activities like meetings and practices. It doesn't include my work hours in there, which are flexible. Time: the rarest and most fleeting of commodities.